Like a bleak winter day that keeps repeating itself over, and over, and over again, the world of theater is once again returning to an old, familiar well by looking for another popular film to adapt into a musical. 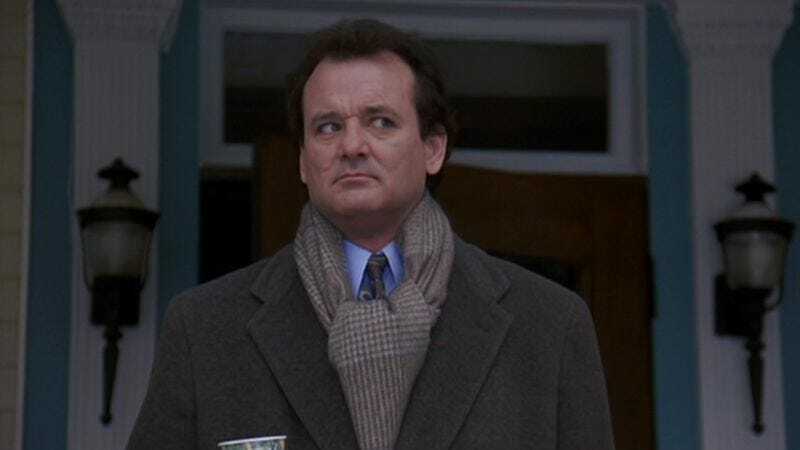 This time it's Tim Minchin and Matthew Warchus, producers of Matilda The Musical, who are eyeing Harold Ramis' classic 1993 comedy Groundhog Day, in which Bill Murray is stuck reliving February 2 again and again until he gets it right. The producers are still writing the book for the show, and haven’t yet decided whether to debut in New York or London. (Matilda is a current hit in both cities.) But they are sure that the stage is the right venue to properly capture the excitement of a large squirrel predicting the weather. While no songs have been written for the show, we can expect a bunch of upbeat numbers unsuited to Murray’s deadpan tone, perhaps with titles like “I'm Not The God, I'm A God,” "19th-Century French Poetry (What A Waste Of Time)," and "I Keep Trying To Kill Myself (And Failing)."